I consider myself a fairly worldly Domestic Goddess. I’m up with all the newest superfoods, and latest diet trends and fads. I’ve cooked gluten-free gingerbread (read about that here), we have play dates with kids that are lactose intolerant (Oreos are a god/dess send!) and with a vegetarian sister-in-law I am quite adept at modifying my cooking and baking skills to whatever dietary requirements the diners may require. And, (if I do say so myself) I’m pretty good at it. But this weekend I hosted a dinner party for a work mate and his girlfriend who are Vegan. They have previously been Paleo, but decided to try vegan for health reasons, and as she was already vegetarian. They’ve been doing it for about 4 months and have been going along quite well – lots of yummy looking salads for lunch, an amazing brownie made with applesauce that was sent along to work, as well as cool new cafes with vegan menus they had discovered. So I though having them over for dinner would just mean looking through my recipe book and picking a handful of potentials. Let’s start with entrée or nibbles. My Go-To is usually a cheese/dip platter, with maybe some cabana/cured meats. So just make it vegetarian dips, carrot/celery and crackers right?? Easy! Well yes, but most “crackers” (apart from water cracker and rice crackers) have butter as well “milk solids” in them. So none of my fave Lavosh bikkies got put out, but I did get to whip out the recipe for a roasted capsicum dip (muhumara) and make that. And I also made the good ol’ bake-in-your-oven pita crisps (olive oil spread on a pita bread with or without a sprinkle of paprika and baked at 200’C for 10 mins until crispy). Add some carrot and celery and a (store bought) roasted onion hummus and we were starting well. Main course I figured would be pretty easy; after all I’ve been cooking vegetarian meals for years! I had plenty of soup options (minestrone, red lentil etc) but that didn’t really say “Dinner Party Main Course" to me (more like “Casual Lunch”). I have a great stuffed mushroom recipe that I thought I could substitute pesto for the fetta – forgetting that pesto has Parmesan (fail). My dahl recipe is vegan (as long as I use vegetable stock and not chicken) but again, not really fancy. Or maybe a big plate of roasted veges? With gravy made with vege stock? Suitable but Not likely. Not to worry, I have a Heap of pasta recipes – surely they can be vegan-ised!! Husband does take issue with things that Should be meat that Aren’t (don’t get him started on vegetarian lasagna!). So that go struck out. Luckily I have a sweet potato gnocchi recipe that is just sweet potato, (normal) potato and flour – phew! The sauce is a “roast capsicum with gorgonzola” which (as I despise gorgonzola) I have made without the cheese before and its still quite delicious. But then on closer inspection, it has cream in the sauce (Argh!!). Would it still stand up without cream? Just to be safe I added a few more steps from another pasta sauce recipe to give it a bit more flavour (frying onion and garlic, deglazing with white wine etc). Dessert, I knew was going to be tough – not being able to use butter, eggs or milk pretty much cancels out all of my Dessert cook book section! I know there are lots of vegan desserts, but they seem to use a lot of dates and other very sweet things which (ironically) is what I’m trying to avoid in MY diet. I can’t even use honey with vegans! Though, thankfully maple syrup would have been ok. I could have spent several hours searching on Google, or caught up with my vegan school mum friend and picked her brain, but as time was running short, I went with the easy option of a fresh fruit/nut platter and some of the yummy Loving Earth (vegan) chocolate that I had (conveniently) been gifted for a birthday present. I am happy to report that Salted Caramel Swayzee and Very Buck n’ Berry were both delicious (in a totally non-chocolate way) and Husband found a yummy (if expensive) punnett of strawberries to have with some grapes. And thankfully my guests were not too fussed when it come to which wine to drink because egg whites are a common agent used in wine production = sheesh! I’m learning so much from this!! So the pasta sauce came together nicely (and had the kitchen smelling of roasted capsicum all afternoon). The gnocchi was a bit tricky in that it was quite a sticky dough, even with adding more flour than suggested. And also leaving it to sit it for a few hours did make it more like globs rather than lovely “parcels”. But they still tasted yummy, and when smothered in sauce, who cares what they look like! But as with all dinner party, the most important ingredient was the people, who were lovely and gracious about the lengths I had taken to ensure I was correctly feeding them. And we exchanged tips about using applesauce and flaxseed meal as an egg alternative, which will be very helpful for the Next time we have them over for dinner. I was made aware of a strange Human the other day – a man who doesn’t do Leftovers. This blew my mind. On SO MANY levels. So much so that I had to blog about it. Leftovers. For a word that sounds so second rate, in cooking it is a magical thing. I have already blogged about how awesome they can be (see here for a refresher). They’re like a little magical gift from your fridge, “I know you don’t feel much like cooking tonight, so here’s a meal you prepared earlier! Or some bits and pieces that (when combined) will make a really easy dinner!”. There are certain dishes that I love making because I know the recipe will make too much. Like my Speedy Tuna Pasta (that is the actual recipe name, not my iteration. Though it is super quick to make. This is why we love it). Or the risotto we had for dinner last night that I made for Saturday night’s dinner, knowing that it made enough for another dinner (We've got a school Bake Sale this weekend – I needed kitchen time for cookies and cakes not meat-and-three-veg). And when Husband makes a roast dinner (which, luckily for me, is fairly often during the cooler months), he deliberately buys too much meat and cooks too many veges. Which means we can have several meals out of one lot of cooking, as well as roast pork for yummy rolls for lunch. Speaking of lunch, here is another point for Leftovers – the cost. Any financial planner worth his (Himalayan pink) salt will tell you one of the best ways to save money is to bring your lunch from home. When two sushi rolls or a lame sandwich and a drink from the café leave you with little change from $10, you know you’re on a good thing when you can make a week of lunches for the same prices. Not to boast but I can’t remember the last time I had to buy lunch for work. Most of this is due to a fantastic house husband who keeps me in rolls and salads, but I also have a stash of vege slice in the freezer for those Cant Be Bothered Days- like today! Hmmm. Their freezer must be really neat and tidy without all the leftover meals sitting there. He’s also averse to frozen meat. Crazy. But back to dinners. We all have those dishes that taste better after a night in the fridge – gumbo, stroganoff, lasagna. But how would we know if they were thrown in the bin? And that’s another thing that really gets in my 21st century craw – the Food Waste. Having a husband who works in fresh produce, we see how much food doesn’t even make it to be sold to the consumer (which is bad enough). But then to Throw Out anything unconsumed just leaves me aghast – all of the resources that went into creating that nourishing food, going to landfill. In our house, leftovers go in the fridge/freezer to be used again. Anything that’s not enough to make a meal or snack gets divided up between the chickens and the dog. And most other food waste goes in the compost bin, leaving only onion skins and citrus that actually makes it into the landfill bin. Granted you can makes these recipes using “fresh” ingredients (not leftovers), but where’s the fun in that? And I bet they wouldn't taste as good either. So in these days of Food Miles and Less Waste, I’d like to again champion those who do their best to make sure No Food gets left behind. We get creative and clever, and sometimes it's probably not a Meal as much as a Collection of Food objects, but we’re helping the planet (and our purse strings) just that little bit more. In other Domestic Goddess news – I got a Kitchen Aid. A second hand one from a friend but still – it’s black and its beautiful. I took it for a spin yesterday and it made my cookies in less time, and made my chocolate cake so light and fluffy that it rose over the middle of the doughnut tin! Who knew how much quicker things would be when you don’t have to stand there and hold the mixer! I also got super enthused and cooked a cake for afternoon tea. I have NEVER done this before. But when your Son smells the cake you are making (for the bake sale) and raves about how great it smells, it does inspire you to make one for him. And serve it straight from the oven with butter melting into it – yum! It’s been a long time between blogs. Last week marked two years since I returned to full time work. Which means two years of not being the main Meal Planner and Food Organizer, as well as being home A LOT less during the week. All of which logically add up to Less Time for Cooking. But then there are the other hidden issues that sneak up on you. Like being so tired on a Friday night that you don’t have the mental energy to look through a cook book and see "what takes your fancy” as something to cook, even though its kind of “your turn” to cook at weekends. Like leaning more towards recipes spruiking “quick and easy” rather than new ingredients/techniques/cuisines. Because much and all as it would be lovely to hide in the kitchen on a weekend and spend 5 hours lovingly making lasagne from scratch (fresh pasta lasagne sheets included), there is also the important task of making sure the Stay At Home parent gets a break from parenting/pet caring/housework at the weekend too. So my cooking exploits lately have narrowed considerably to include Muffins for the Kids school lunches and cooked Weekend breakfasts. I have thrown in a few Thanks for the (insert good deed) Cookies and a batch of soup for a sick friend but nothing anywhere near 8 hour pulled pork tacos or the like. I even tried to do a Cook Each of my Soups on a Sunday for the winter, but I think I stopped after three. Life gets in the way. So what does a domestic goddess do when faced with this situation? Or I could (more sensibly) go with the flow. Recognize that Culinary goals change; that perhaps teaching Sons 1 & 2 how to make Caramel Slice is a good use of my skills. Or getting creative with leftovers rather than starting from scratch (much less brain power required as part of the ingredients are already there). Point in case: we had left over roast pumpkin that I turned into pumpkin and haloumi burgers for dinner (and my lunch the next day), and I also used up an about-to-expire tub of sour cream by making beef stroganoff. So I guess I’m going through a fallow period at present – I have the recipes and the skills (and many cool ingredients), I just need the time, and brain space to get the creative juices flowing again. So you've done a rather successful Star Wars party for your younger son. You've taken both boys to see the new Star Wars movie and they both loved it. Son 1's birthday is coming up. What theme do you think he was requesting?? Yep, the Return of the Star Wars party. This time, for 10 year olds. As the kids get older, I have been aware of things that Were Cool only a year ago, suddenly become Not Cool, or "for babies, mum!!". 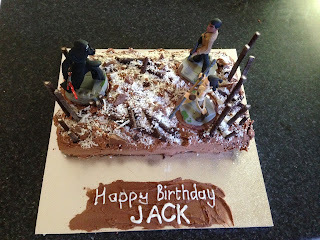 Luckily Son 1 was at home for Son 2's party, so I could ask "what did you want at your party?" without seeming like a clueless mum. I was already ahead of the curve, as at his party last year, we switched the format to an afternoon-early evening party time, and gotten take-away pizza as the hot food meal (MUCH cooler than party pies and chicken nuggets). So that was sorted and meant less foods to organise. Also, amidst all the cool Christmas presents, we got a "Stormtrooper Cookie Kit" - packet mix cookie dough, white and black icing and a cookie cutter. Son 1 was very excited to be making these; I just had to get over my prejudice against Packet Mix (*sniff! * Mine made from scratch would taste Sooooo much better). In their defence, the "just add water" instructions were pretty easy to follow. It was easy to roll out and cook (though only made 10 cookies). But I did run into some issues with icing them. Rather than use the "icing sugar" mix they had supplied, I used some royal icing I had left over from decorating gingerbread men at Christmas. Because that's what it had been used for, it was a bit thicker than you would usually use to ice a large area. I started with Ro's technique of outlining the cookie shape, then filling in and mixing the icing with a toothpick to get a smooth finish, but that ended up with more icing being pulled OFF the biscuits rather than on. In the end I went with the good ol' knife/spatula option. Worked a treat. I did use the black icing gel supplied in the box as it meant I didn't have to try and source or color black icing. * It worked well; the nozzle was quite small so gave a lot of control. I did try and be clever and make First Order trooper helmets as well, but they didn't look as good in my opinion). The lesson? Retro always looks good. We had chips and cheezels again, but as we had a new movie (and cool new characters), these were now Jakku Chips and BB-8 bits! (thankfully funny food labels are Still Cool). Galaxy Bread also made an encore appearance; you're never too old for THAT apparently. For the cake, I felt it was time to stretch myself creatively; at least a little bit, in the confines of working and having a dinner the night before. A mini stretch maybe? My girlfriend had her daughter's 4th birthday before Christmas and it was (as you would imagine for a girl that age) a Frozen theme. 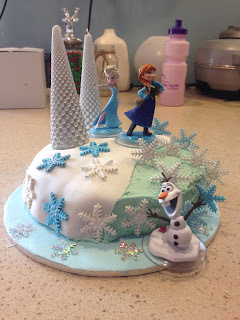 She had seen on Pintrest that people were using the Disney Infinity game pieces as cake decorations: not only did they look awesome but you could then play with them afterwards! We were quite happy to lend her ours (we are big Disney fans as well as Star Wars), and it looked very effective . Which got me thinking that maybe I could use the same theory for this cake. There is a fairly important scene in "The Force Awakens" set in a snowy forest (relax - no spoilers, there are scenes from it in the trailer). So I wondered if I could make a snowy forest landscape for my Star Wars-Force Awakens figurines - chocolate frosting as the "ground", mint sticks for the bare tree trunks, and coconut or icing sugar dusted over all as the snow. Sounds good in theory (and looked good in my imagination), let's hope it translated. 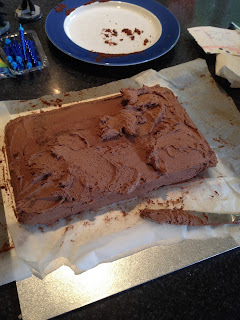 I started well., with a rectangle cake and a heap of chocolate frosting. I quickly realised after my crumb coat that I had to ignore all the Rules of Frosting; forget all the skills I had developed over several years of decorating. 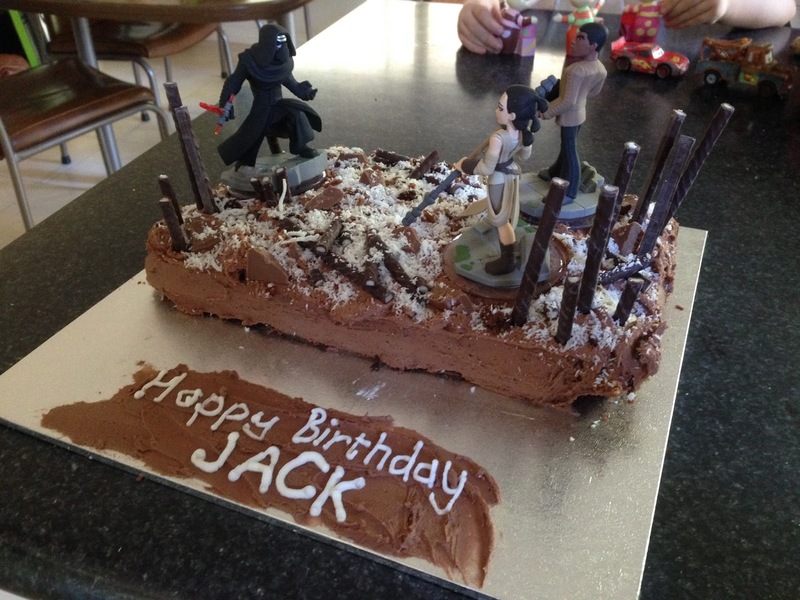 This was meant to be a forest, and one where a lightsaber duel had been taking place. So no smooth edges and neat sharp corners, there needed to be lots of texture and uneven ground and piles of .... foresty stuff. 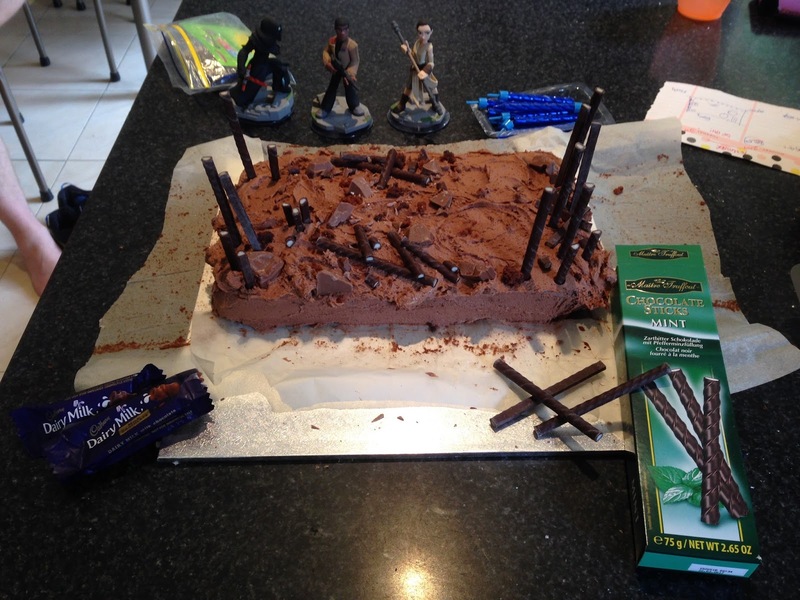 So it was quite fun being very haphazard in my frosting application. We then had a blizzard of coconut (both shredded and dessicated for a more textured effect) over everything, before placing our heroes safely in their scene. I must admit I was pretty happy how it turned out. Possibly because it was such a simple idea, and also because it was one that I was kind of making up as I went along. This does not always go well (there is usually lots of swearing and wishing I had drawn up a Plan), so it was nice to have an end product that vaguely resembled what I had in my mind. I got a big "Cool!!" from the birthday boy and lots of other compliments which is always good. In fact the only drawback was one of the kids who "I don't like coconut!". It was alwasy a risk (at least it wasn't an "I don't like chocolate! "), so he got a piece of cake with the frosting shaved off. So another successful Star Wars party. And as the next movie is due for release at the end of 2017, there's not harm in putting away ideas for what will be a 9th and 12th birthday party is there?!?! ** here was another place where the black choc melts would have looked great - different colored rocks and boulders!! I’m always a fan of a themed party; whether its Yule (see here and here), Christmas, or age appropriate birthday themes. Thus, I always have sleepless nights get excited when I have a kids birthday party coming up. Son 2’s birthday was in October, so I started dropping hints early September about what type of theme he would like (It's always a delicate dance between what HE wants and what I think I can work with). His first suggestion was Jurassic World, which had me envisioning lots of fossil and dinosaur related treats (which I had seen around the Interweb). Not a bad start, BUT with the new Star Wars movie (Episode VII:The Force Awakens) coming out a few months later (and us being a house of huge Star Wars fans), I easily steered him in that direction. We have always been fans of Star Wars. Husband and I have had several occasions where we watched the original trilogy back to back (one time with special blue colored milk). We went and saw all of the remastered movies when they came out, as well as all of the prequels on opening night. We have shelves of books, boxes of toys, cups and plates, and even had a large film poster dominating our lounge room for many years. 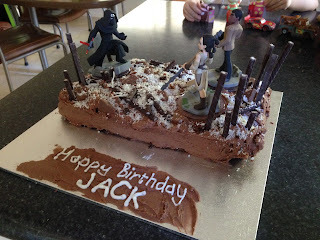 With the newer cartoons of the last few years, I had done a previous Star Wars:The Clone Wars party for Son 1. We had that party in a park, which did impact on my creativity as I had to be able to transport everything there and back. I was able to have a few Star Wars touches (like lightsaber breadsticks, and we made Stormtrooper masks), but not the whole shebang like I would have with a party at home. As with most themed parties I throw, it becomes more about what I DON'T end up making than what I do. With Pintrest and many many Star Wars fans on the internet, there are A LOT of party ideas around! After my Minecraft party (....which I didn't actually blog about), Son 2 liked the idea of cool food labels, so it was also what I could get a good pun name for. No – much more sensible to do Han SOLO! And his friend, Luke Sky-Water! I did my breadstick lightsabers again - small pieces of aluminium foil wrapped around grissini-style breadsticks. (I even still had the on-off switch colored stickers I had used from Son 1’s party; I kept them “just in case”. Because that's what I do). We also had A.T-C.H.I.P.S and Death Star Bites – not very pun-worthy but it was then best I could come up with for potato chips and cheezels (two party staples)! 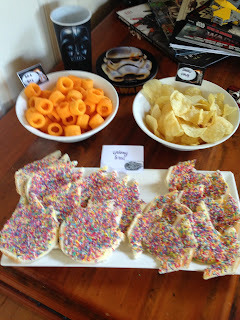 Another party staple is fairy bread, which has made it into several parties by way of cookie cutters to cut the bread. Luckily for me, my brother (who lives in Canada) had sent me some Star Wars sandwich cutters (as well as some pancake moulds – if only I could have incorporated them!). So that made it easy to have Galaxy bread (as in “… a galaxy far, far away). For hot food, we had mini Hutt Dogs (straight from Pintrest) and X-wing bites. 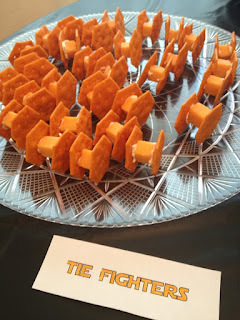 The X-Wing bites came from trying to think of something to do with chicken nuggets (One of Son 2's favorite foods)! I ended up using chicken fingers (rather than nuggets), and joining them in an X-shape with toothpicks: very low tech but very well received. 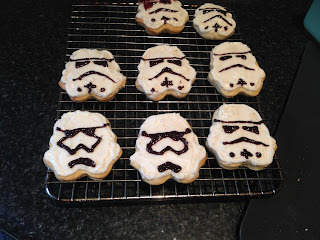 I also made a batch of Wookie cookies (thanks to Ro for the idea). I used a slightly different recipe (its quite tricky to find "tofffee bits"); the Neiman-Marcus oatmeal cookie recipe (I didn't blend the oats to give them more of a textured look). I also attempted to make elongated cookies (more Chewbacca-esque shape) than Ro's round ones; but as you can see, they did that anyway as I didn't space them our enough on the tray (seriously, I was not going to dirty another tray for ONE cookie!). The most misshapen ones were the "quality control" cookies. Looking more like Adipose from Doctor Who rather than a warrior from Kashyyyk. But still yum. I also did a a variation on the s’mores that I had been making. 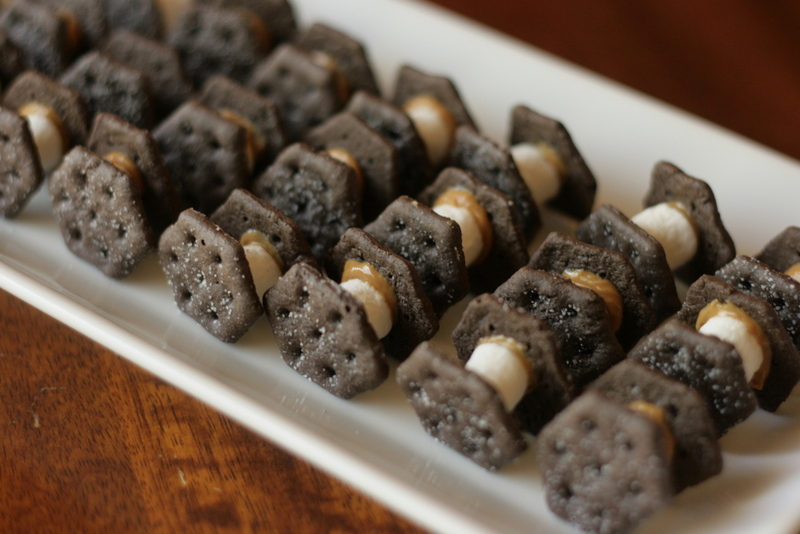 But by this stage of planning I needed a few more sweet things, so decided to make my own s’mores TIE cookies! A batch of chocolate cookies cut in a hexagon (very hard to find a hexagonal cookie cutter! ), with a marshmallow in-between, held in place by melted chocolate. Yum! And to offset all that sugar, I also made FruiTIE fighters as well – (smaller) hexagons of melon with a grape or strawberry in between. AND in the just-because-its-cool category, I had marshmallow Storm trooper helmets. This one mainly came about because I had been suckered into buying a bag of Jumbo marshmallows from Costco. Which look great, but are quite difficult to toast over a fire, so I still had ¾ of a bag-full! This was fun as I could use the helmet design for the newest trooper from “The Force Awakens” as well as Clone Troopers. The trick with this was tracking down a black food pen, as well as drawing precisely on a spongy surface! Not terribly drawn, just not super well drawn. In easy Grab-and-Eat appropriately themed cups. And you can’t just eat at a party, you need activities (especially with boys!!). Husband has amassed quite a collection of Star Wars figures over the years, so they got pulled out. And being 7 year old boys, I knew that if I could incorporate shooting things, it would be a bigger hit. So I set up a Star Wars shooting gallery – Nerf guns aimed at different size figurines. We found that Jabba the Hutt was quite difficult to knock over due to his wide base. As was the super sized Qui Gon Jinn. Sticking with the idea of Use What You Have , I also organized Trooper Bowling (another Pintrest idea) – I printed out a few Stormtrooper masks and stuck them to the pins on our bowling set. The we could roll our “Death Star” bowling ball to it and see how many troopers got knocked over (and for the Fans out there – yes, I know the Stormtroopers were on the same side as the Death Star, but it worked better that way!). And finally some combat practice. A popular Star Wars party idea was to make your own lightsabers; some parties even made this as an activity. I knew from previous years that the kids didn’t want to MAKE things so much as PLAY with them, so I pre-made these. Super complicated: Step one – purchase pool noodle from shop (in appropriate colours – I had blue and green as I didn’t want any red Dark Side sabers). Step 2 – cut pool noodle in half to make a suitable blade for 7-year-olds. Step 3 – sticky tape “Lightsaber hilts” (printed out from the internet) around the base and voila! But make sure to set some rules before you unleash them on each other, or it would be chaos (ours were No Hitting on the Head and only Two people fighting each other at a time). Last but not least, we had the cake. If I had the time I would have made something awesome like this or even this!!! (I would have loved making the X-wing and TIE Fighters. The oodles and oodles of Death Star building bits not so much). But as I had the kids party as well as a family party in three days I decided to be sensible and go the cake topper route. The kids had a ball, the food was a hit and all went home happy. The Force was indeed with us. Traditions – those time honoured rituals that can put a big smile on your face and make you feel warm and fuzzy inside, or conversely scowl and fume with obligation. They can have been around for thousands of years or just a nice recent habit that kept going. On the whole, I love A Tradition – something that you often get to do only once a year, which reminds you of the fun times you had doing it in previous years. Some are outdated, some don’t correspond to our hemisphere and some we’ve just adapted for the obscurest of reasons, and some are just, well, Tradition. Tradition: we catch up with friends (Mr and Mrs Frenchman) for dinner. This lovely tradition has been happening since the early Getting-to-Know-You days of our friendship; in fact I think it was our third or fourth dinner together that we caught up on Good Friday, because I happened to mention that I cooked homemade Hot CrossBuns. Which became that dinner’s dessert. And I think we've caught up every Easter since; 4 days off means 3 nights to catch up, plus there is usually a baby sitter or two available. So it was our turn to host this time. But what to serve? Tradition: don’t eat red meat on Good Friday. Ahhh That religious tradition. This was one I strictly adhered to throughout my childhood – you would always have fish fingers or I & J fish fillets for dinner on Good Friday. As I got older and realized where the tradition came from, I took great joy in eating hamburgers, or spaghetti bolognaise or steak on Good Friday. But this year, it seemed like a good source of inspiration (or madness). I would make Fish Tacos. Again. Whenever I have a recipe fail (read here if you need a reminder), I always feel I need to go back and Get It Right. Prove that I am the Domestic Goddess that I like to think that I am. So this one had been bugging me for a while, and if Good Friday wasn’t a good day to cook fish then I didn’t know when was! You want to eat them, don't you?!? And I was interested in making Baked doughnuts, as one of the reasons I am reluctant to make traditional doughnuts more often is the whole Frying in a Large Pot of Boiling Oil thing. Which I really should get over as I have about 4 or 5 yummy looking recipes to try. Right so mains and dessert sorted, just appetisers/nibbles to organise. Well, that was easy. Tradition: we start our dinners with bubbles and cheese. Champagne is a no-brainer. I think most of my celebrations and parties officially start when the cork is popped. Cheese is a Let’s-Be-French tradition that we have heartily adopted (though our hearts probably don’t appreciate too much d’aphinois). So menu sorted, ingredients purchased and a day off to get it all sorted. Tradition: I will forget at least one ingredient. So this time, it wasn’t a Forgetting, rather than an Assuming – that the ice cream we had in the freezer was vanilla, when in fact it was Cookies and Cream, which is quite yummy but might just be a bit too much chocolate for some. But where to buy ice cream on Good Friday when all the supermarkets are closed? I had hope my local petrol station/mini-supermarket would have some small tubs but alas they didn’t so we switched to cream for dessert. No biggie. The chickpeas were another story. Now in my defence they were on the shopping list, just put it down to shopping on the Thursday Before Good-Friday (when people at supermarkets are mental!!) by Mr DG (the artist formerly known as Hubby). Luckily I had two small tins in the cupboard for use in salads, so it just meant a smaller batch, but as it was a Side dish that was ok.
Not sure what happened to the fresh coriander, I think that was me. But luckily the dried stuff worked ok. Tradition: The new recipe I try will be almost perfect (but not quite). Common hostessing lore suggests you never cook a new recipe when throwing a dinner party. I use dinner parties to try out new recipes! Which as readers will know, usually turns out ok. But more often than not there is something that could be improved. The doughnuts were going along swimmingly, rising and proving. 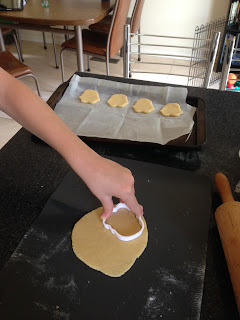 I didn’t have a 3.5cm cookie cutter for cutting out the holes so had to freehand it. The glaze was all made and I was preparing to dip them. However I don’t think I let the glaze cool quite enough as it was still a bit runny, which mean they weren’t as picture perfect as the cover. Still tasted quite yummy, if anything it meant there was more glaze to dip your doughnut in (which is never a bad thing). So all things pre-prepared as much as possible, guests arrived,, champagne popped and cheese munched on while I cooked the dinner. Learning from my mistake, I had the frypan in med-LOW (not med-high) for cooking the fish and had plenty of olive oil in the Good Frypan (the one whose non-stick base hasn’t been scratched and worn away). And the tacos turned out great! My only Point of Improvement would be to not “flour” them until just before cooking (the recipe calls for throwing your pieces of fish into a mix of flour ad spices to coat them). The flour did become a bit like a paste on some pieces, which thankfully didn’t increase their sticking to the pan-ness. So with nicely cooked fish, some yummy salsa and sour cream, and tapas side dishes, out Mexican feast was ready to consume. ... even if the glaze slid off and it was cream not ice cream on the side. What traditions do you like to follow (or ignore)? Cooking is such a collaborative process. There are only so many ingredients to cook with (until they find the next super food that is OMG totes amazeballs and will, like, totally Save Your Life!!) and unless you get all finicky and molecular gastronomic (yes, it’s a word), only so many way to cook it. So you take a handed down recipe from Grandma and tweak it yourself, you substitute an ingredient for another you prefer and a new dish is born, you see an idea and think – Hmmm, I can do better than that. Which is my favourite part – seeing an idea in a magazine, on a Pintrest board or in a You Tube video; and making something cooler and (slightly) newer. Here are some of my recent creations, or Riffs on the Traditional. I’m not sure where my fascination for ice cream sandwiches came from, but I’m going to blame Ro from Nerdy Nummies, who had these super cute cheeseburgers ice cream sandwiches. And then she followed them up with Captain America ice cream sandwiches! (love the star on that one). And THEN I saw a Jamie Oliver recipe with a sponge like “bread” rather than biscuits. Plus we went to Fat Bob’s Burgers (which I highly recommend) and they had Pat and Stick’s IceCream sandwiches, which were small enough for Son 1 and 2 to have one each – hooray! So it just got to a point where I felt I HAD to make them. Like when you see a new fashions trend that you think you’d NEVER wear but after seeing it over and over and over, you start to think, “yeah, I could totally pull off harem pants!”. I decided to stick with cookies for my “bread” and was going to go with a basic sugar cookie recipe like Ro, but while flicking through my recipe book I glanced at my Double Chocolate Cookies recipe. Hmmm (me thinks) – if I don’t add the white choc chips, that would make a great chocolate cookie recipe. And THEN it would be like an Oreo – chocolate biscuits with vanilla filling – winner! I made the cookies using a scone cutter to get a sensible size (which, for those of you playing along at home, is small enough to eat in one hand). Watching Ro’s two rather unsuccessful attempts to make the ice cream centres, I devised my own; allow your ice cream to soften and then spoon it into your cookie cutter (much like making a vege burger); pop these circles on a tray back in the freezer until serving time when you assemble said sandwiches- much less mess and fuss and wastage and faffing. You will note that the scone cutter didn't make Perfect Circles of Ice Cream. And two big thumbs up from the 5 boys I served them to as well. This one was more of a direct substitution. My Cupcake Addiction had a great video on Bake Sale Hacks, which had some really cute ideas. Now while I will probably never make a Twix Pie, I did like the idea of the S’mores cookies. S’mores have been another treat that has been kicking around my brain for a while; it’s the whole American thing as well as it taking me so long to figure out What they were, and I STILL haven’t worked out how to make them on a campfire! So these cookies seemed like a great idea for a burnt-finger-less S’more. And while I love choc chip cookies, I did think that the traditional Graham cracker would work better. But as we all know, we don’t HAVE them in Australia, to the vexation of many American ex-pats and those who have partaken of the s’mores while overseas. As luck would have it, Ro had done a video where she made s’mores cookies, as well as the marshmallow filling From Scratch! So I grabbed her recipe, adjusted it for Australian cooking (note – Pastry Flour is not SR Flour or Plain pasta flour; its something we don’t have Down Under– I got a conversion that its plain flour with cornflour mixed in. OK? OK). So I made a heap of graham cracker circles; I was even going to put a smiley faces on them (with two choc chip eyes) and call them Smiley S’mores but thought perhaps too much chocolate? Maybe next time…. When I added the chocolate and marshmallow to melt, I found that if I had my oven on Really Low it took forever (I blame my electric oven that takes Forever to heat up!) – so I bumped up the heat and kept an eye on them. I found that the freezer is indeed better than the fridge for “setting” them, after which you can then store them in a container until they are devoured by the 9 kids at your lunch-catch-up. So with the success if them, it was only a matter of time before I made the link to …. 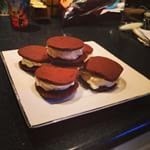 I think Son 1 and I where chatting about whether he could have a s’mores cookie or an Oreo as his “treat”, when I made the glorious link to a s’moreos: marshmallow/chocolate filling but with Chocolate biscuit rather than Graham Cracker. (who was saying something about too much chocolate??). So substituting the cookie recipe from my ice cream oreos worked a treat, and they looked good as that recipe makes quite a dark chocolate cookie, which meant you could see the milk chocolate inside. What new dishes or baking creations have you come up with?